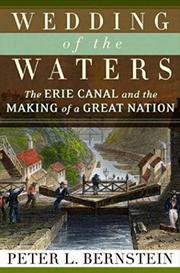 Crisp, insightful history of the canal that transformed New York into the Empire State and the US into an economic powerhouse. Stretching 363 miles from Buffalo on Lake Erie to Albany on the Hudson River, the Erie Canal was the technological marvel of its age. Its celebrated opening in 1825 culminated a century of effort by dreamers, tinkerers, merchants, and politicians who sought to build an artificial waterway linking the trans-Appalachian region to the Atlantic seaboard. Bernstein (The Power of Gold, 2000, etc.) deftly lays out those efforts. In the young republic, canal-building often failed. George Washington’s attempt to create one along the Potomac River, for instance, was a financial disaster, later prompting Thomas Jefferson to dismiss the idea of a canal to the west as “little short of madness.” It took brilliant, hard-nosed New York governor DeWitt Clinton to push the Erie Canal through a thicket of obstacles, including lack of financial assistance by the federal government or any sister state, the War of 1812, and nine years of stalemate in the state legislature. Bernstein also pays full tribute to lesser-known managers and often-anonymous workers who improvised methods of hacking the canal’s path through the wilderness. Two project engineers, Benjamin Wright and James Geddes, had been judges and surveyors before assuming their posts, but went on to eminent careers in their new field. Financing the canal proved equally novel, with New York State selling bonds to the public at large and even to foreign financial markets. Along with the canal’s well-known effects on the state and national economy (e.g., reducing the trip from Albany to Buffalo from 32 days to 5), Bernstein also highlights its social impact and larger national implications as the Midwest became tied to the free North rather than the slaveholding South in a vast commercial network.